Middle School students sport their "Let's Talk" winter toques. 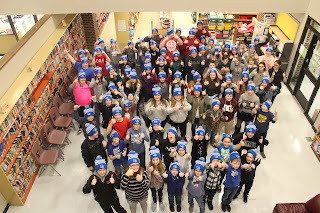 Students at Blackville School participated in mental health awareness activities during Bell Lets Talk Day on January 30. Further activities are also planned on Thursday, January 31 when the high school students return for the second semester. The students will be signing a "Let's Keep the Conversation Going" banner and have opportunities to express their thoughts on metal health, how they can support each other and how to fight mental health stigma. During the Bell Lets Talk Day, Bell will donate 5 cents toward mental health initiatives whenever the #BellLetsTalk hashtag is shared on Twitter and Facebook. For more information, click here.